Comprehensive tourist information provided in every cottage. Garden furniture and barbeques at all the cottages. Bed linen is supplied in all the cottages and each bed has a duvet and two pillows per person. All beds have mattress protectors and fleeces. Bath and hand towels are provided in all the cottages, and consist of one each per person booked to stay, along with bath mats. Hairdryers are provided in every cottage and any cottage with an en-suite having additional dryers in that bedroom. Tea towels, dish cloths and cleaning agents are provided in all the cottages. A starter pack of toilet rolls is provided in every bathroom. Tea, coffee, sugar, salt and pepper are also provided. Cots, High Chairs & Stair Gates are available on request along with cot bedding. Open Fires Coal is supplied along with a packet of firelighters. Televisions : All cottages and B&B rooms have a TV. Each cottage has a 32”LCD flat screen TV and DVD player/ Video recorder in the living room and I-Pod Docking Station CD/ radio players. All master bedrooms have LCD Television and at least one other LCD Television in the cottage. Library : A collection of Books, DVD & Videos are in every cottage. Electricity : the first £25 of electric used is included in the quoted rates for Honeysuckle, Bluebell and Primrose Cottage. £35 of fuel in The Garden House is included in the rental. Any excess usage over and above these stipulated rates will be charged for separately at the end of your stay. Parking : There is ample private parking at all the cottages. Please park with due respect for other guests. For Honeysuckle Cottage, park to the side gable end, or facing the rear garden; for Bluebell and Primrose cottages, park facing the rear garden. For the Garden House, park to the side of the garage facing the wall. Groceries : An order can be taken and placed in your cottage for your arrival. Alternatively, you can order your groceries on-line and have them delivered to your cottage by one of our local supermarkets. 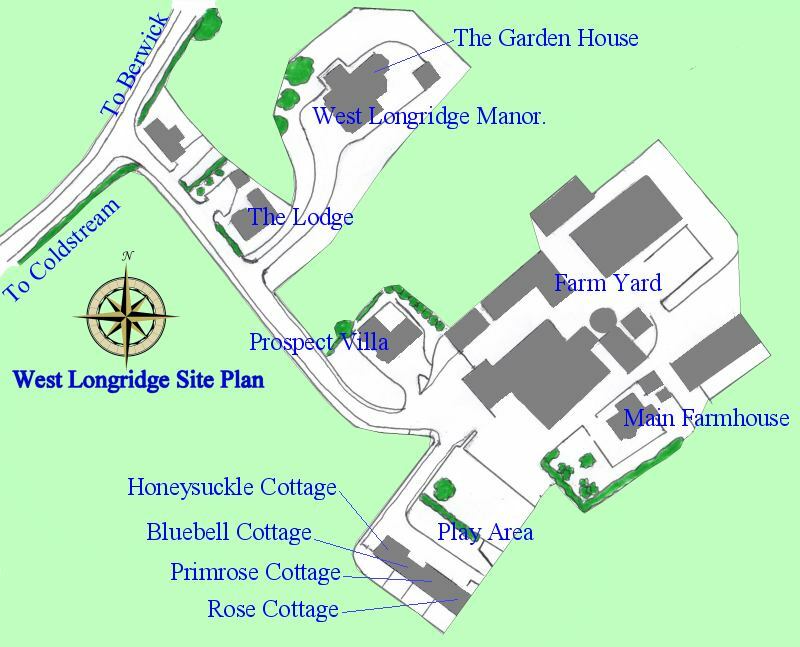 For reference – Honeysuckle- No1 Cottage, Bluebell- No 2 Cottage, Primrose -No 3 Cottage West Longridge Farm. Garden House wing of West Longridge Manor. Play area : Play house and swing/see-saw set at cottages. The Garden House has its own swing/see-saw set. Chef/Catering : If you require a chef for any special parties, please ask for details.